Thrilled to hear that our documentary 'Branded a Rebel' won sports story of the year at @FPALondon. Well played @KKudravi & @sbresnahan22! It's a big week for our #BrandedaRebel documentary, it's been short listed for an award with the Foreign Press Association. Fingers crossed! It's not cool to say it anymore, but you have to give Vettel and Red Bull credit. It's their job to win races and they do it very well. 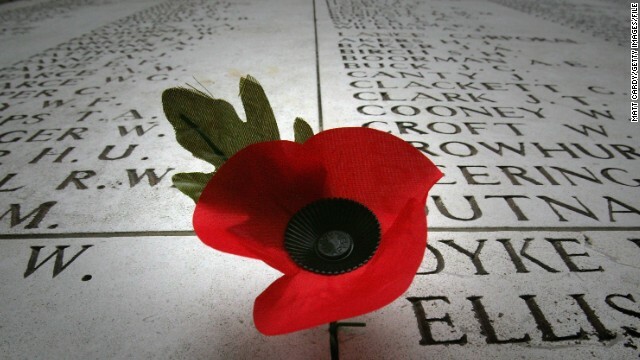 We will remember them, but should sport? Gaining territory, a tactical advantage, physical combat, winners and losers. Sports journalism could easily be confused with the scribblings of a war correspondent, but of course there really is no comparison between a man on the ball and a man with a gun. It’s only a matter of life or death for one of them. But in the United States, professional athletes and soldiers are increasingly sharing common ground and it’s not just because they’re all "in uniform." 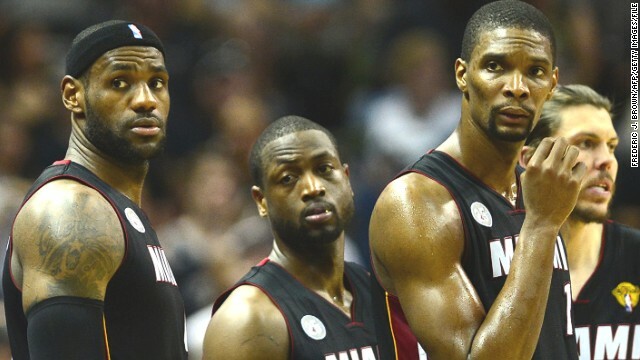 LeBron Jame, Dwayne Wade and Chris Bosh of the Miami Heat wait during a timeout in this year's NBA Finals. They say that "time waits for no man" – except perhaps if you’re a fan of American sports. The United States is the land of opportunity, and on the basketball courts and the playing fields here it represents an opportunity to freeze the clock and make the action last quite a bit longer. 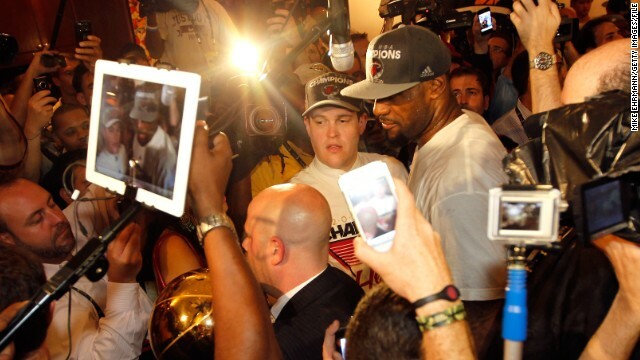 LeBron James of the Miami Heat is mobbed by journalists in the team's locker-room during the 2012 NBA Finals. The Naked Truth: How close is too close? It was the yellow rubber duckies that did it. I suppose up until that point I’d been on auto-pilot, I was just waiting for an interview. But when one of the NBA’s biggest stars pulled on a pair of blue socks – festooned with bright yellow ducks – it struck me that this assignment was way more surreal than anything I was used to. Or, for that matter, comfortable with. Brilliant gesture by Kaka, asking not to be paid while out injured. What chance other players follow suit? Wonder if agent still wants 10%? !